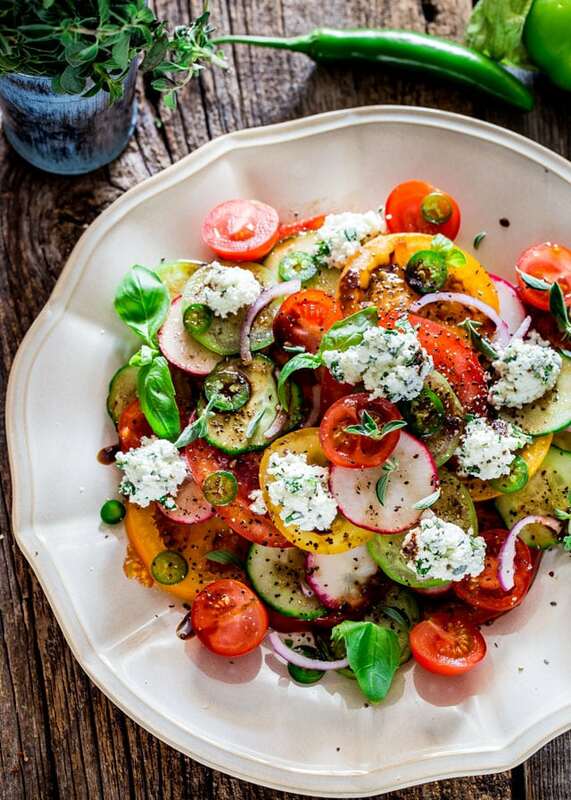 Summer Salad with Herbed Ricotta and Balsamic Vinaigrette – a simple salad with heirloom tomatoes, cucumbers and radishes, all drizzled with a simple balsamic vinaigrette and a dollop of herbed ricotta! Now that the warmer weather is here our summer lunches and dinners are pretty much made of salads and grilling something. So when you pretty much eat the same thing over and over again we try and make all kinds of different salads. I must say that my hubs is a pro when it comes to making salads and although he tries to keep his salads simple they are always incredible. But this salad here, I am proud to say that I made myself. I bought some gorgeous heirloom tomatoes the other day when we went to the market and I just knew they were going to make a perfect salad. 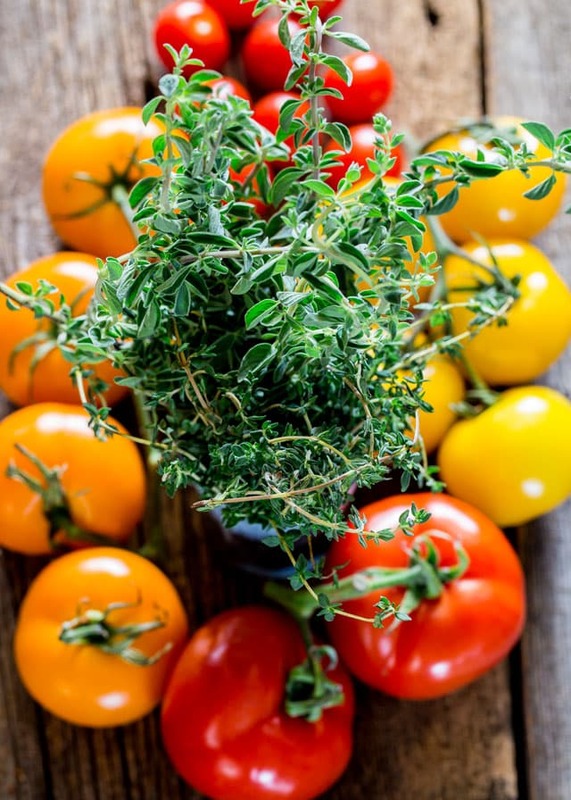 Now when I make salads I also like my salads simple, though every once in a while you’ll catch me throwing in some berries, or mangoes or some sort of fruit in my salads, I like to stick to simple dressings like olive oil and lemon or balsamic vinegar. I’m not one for creamy dressings, but I do enjoy my Caesar salad every once in a while. So let’s talk about this salad a bit because it’s worth talking about. Lots of gorgeous tomatoes, cucumbers, radishes and red onions. Then I got the brilliant idea to add some serrano peppers and boy did it kick it up a notch. Maybe it was just my serrano pepper because it was hot as hell but oh yeah it was worth it. Then there are lots of herbs here that I used to combine with the ricotta cheese. All fresh of course, some thyme, oregano and some basil, make sure you chop them finely and mix it in with the ricotta, so good. And the dressing, as I said, a bit of olive oil, a bit of balsamic vinegar, salt and pepper. That’s all you really need for tons of flavor. That about says it all for this salad. I stacked the tomato slices nicely but feel free to toss everything together, though I thought it looked really pretty like this. Did you love this salad? Try these! 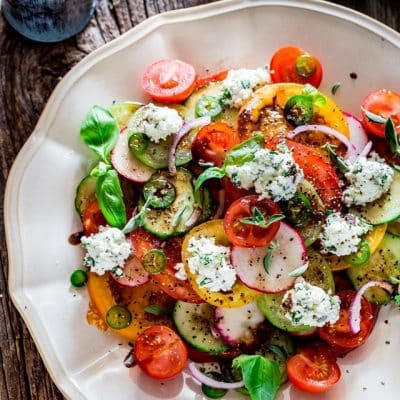 Summer Salad with Herbed Ricotta and Balsamic Vinaigrette - a simple salad with gorgeous heirloom tomatoes, cucumbers and radishes and drizzled with a simple balsamic vinaigrette and a dollop of herbed ricotta takes this salad over the top! In a small bowl combine the ricotta cheese with the basil, fresh oregano and thyme. Set aside. In another small bowl whisk together the olive oil, balsamic vinegar, salt and pepper. Arrange the tomato slices, cucumber, radishes and onion on a large platter then drizzle with the dressing. Season with salt and pepper if needed, then top with serrano peppers and dollop ricotta mixture evenly over the tomato slices. Regular tomatoes will do if you can't find heirloom. You can use jalapenos in place of the Serrano, or leave them out completely if you don't like spice. This is heaven on a plate. So beautiful and with lots of my favorite things. Have a great weekend! This looks really good, but I have a question for ya. do you do any pressure cooking/ and if you do can you post some recipes.